Sometimes pure randomness leads to pleasure. No, I'm not talking about something dirty (get your minds outta the gutter!). Rather, when we end up at a restaurant by fluke or accident, it could lead to a surprise or two. Well, the surprise could be actually bad as well since random visits are a 50/50 proposition. This was the case when we tried to visit Davidson Pitt Stop in Fleetwood. Upon arriving at our destination (after several wrong turns thanks to the GPS, how ironic), we discovered it was closed (apparently for good). Yikes! What now? Thankfully, I had a backup plan in the Prairie Cafe. However, I had no clue about the place and upon walking up to the front door, it was a bit confusing. 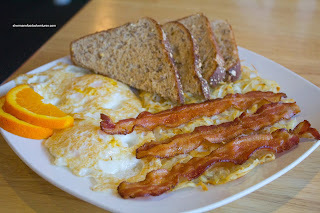 The name Prairie Cafe gave me thoughts about farms, small communities and good ol' comfort food. However, the fact that the signage had Chinese characters was totally unexpected. I guess being Asian kinda confused them as well, since they look a bit surprised when I walked in. I won't lie to you, from the outside, the place looked like a dump. On the inside, it was way nicer than I would've guessed. Quite homey with nice Korean proprietors actually. So I wasn't surprised to see Bulgogi on the menu in that case. The fact that I ordered it at 9:45am might've been unusual though (for Western standards). However, rice and some form of meat is not really a stretch for breakfast in Asia. Take Tocilog for instance. 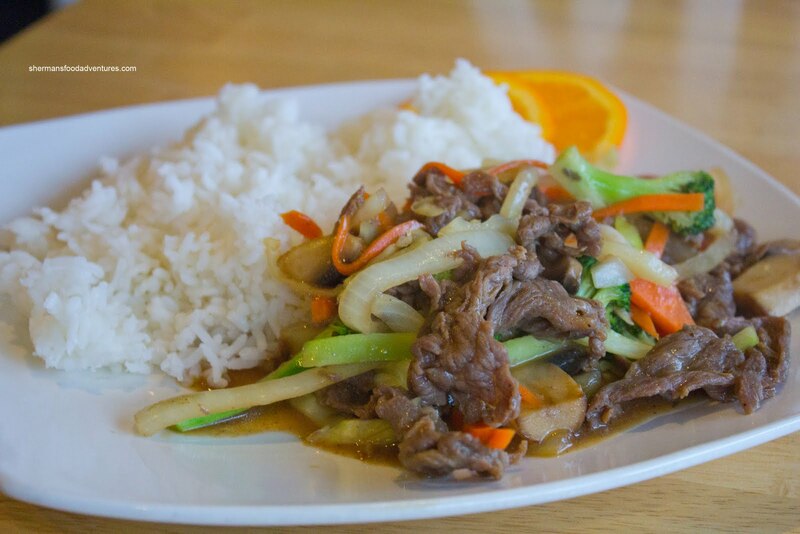 Although the veggies looked vibrant and the rice had a chewy texture, the lack of meat made it underwhelming. I could've eaten another meal after this one. Furthermore, there wasn't enough wok heat (or pan heat or whatever they used), thus the food was watery and kinda bland. Mrs. Spray Bottle did the right thing and ordered the Bacon & Eggs with hashbrowns and toast. She asked for over easy eggs and they were more or less that. Bacon was aesthetically-pleasing and crisp while the hashbrowns were okay. We liked how the breakfast was neatly prepared and not merely slapped on the plate. 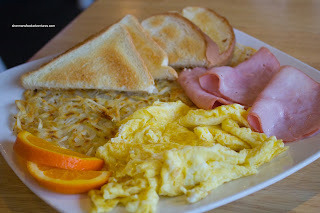 For reference purposes, the Ham & Eggs was equally good with fluffly scrambled eggs and a generous helping of ham. What else to eat in a diner? How about a BLT with fries? Yah, not the most exciting thing in the world. The trick with simple food is to have good ingredients and proper execution. That was mostly the case here. 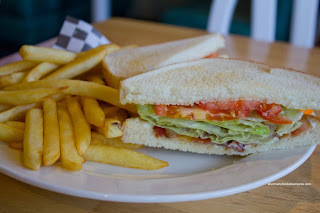 The tomatoes and lettuce were fresh while the bacon was crispy. Fries were pretty good too (for generic fries that is). We just would've liked to see the toast with more colour. It was a pasty white which didn't even look toasted at all. Yet, what did we really expect from a random food adventure anyways? Prairie Cafe does the job for most people looking for a quick freshly made meal. Nothing fancy, yet nothing life-changing either. Bizarre. 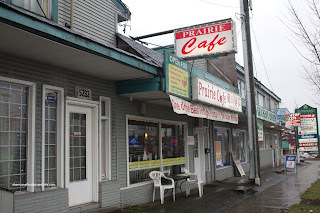 With my work project last Fall taking me out to Surrey & Langley regularly, I actually ate at Prairie. Friendly folks, owner is Korean IIRC. Had some fried rice, IIRC, wasn't bad. @mbsunshine LOL... It was okay though, just not the Korean dish I had. @LR Yah, they are really friendly. I didn't mind the place. Just for me the Korean dish was not that great.